We are honored to announce that the Catalogue for Philanthropy, Greater Washington Is pleased has chosen Mary House as "on of the best small charities inthe Washington DC Region." for the 2017-18 Catalogue! We are proud to have been able to serve our community for over 35 years and look forward to many more. $100: bulk rice and beans, cereals and supplemental meals for children on the weekends. Bill and Sharon Murphy were recipients of NBC 4 and The Community Foundation's 2005 Linowes Leadership Award as "Unsung Heroes in Our Community"
In April 2008, Mary House was inducted into the Washington DC Hall of Fame. Sharon And Bill were awareded the Legacy Award in the area of Civic and Community Development. 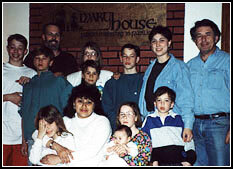 President Bush recognized Mary House as the 1015th Daily Point of Light for the Nation on January 12th, 1993. The award states that "The President salutes the volunteers of Mary House for exemplifying his belief that, 'From now on in America, any definition of a successful life must include serving others.'" The Sanctae Crucis Award is the highest award of recognition Holy Cross bestows upon an alumnus or alumna. It recognizes alumni whose outstanding professional accomplishments, extraordinary community service or tremendous promise demonstrate that they embraced the full measure of the Holy Cross mission: Men and Women for Others. Bill Murphy received the Sanctae Crucis Award May 5th, 2000. Upon presenting the award, acting President Frank Vellacio stated, "Truly a man for others, Bill's empathy, commitment and spirit have made him an icon of Christian charity. William Murphy understands that what we do for the least of our brothers, we do for Christ Himself, and for this the College of the Holy Cross presents to him the Sanctae Crucis Award." The Women of Distinction Award was presented to Sharon Murphy on June 1, 2000 at the National Conference for College Women Student Leaders. The Women of Distinction Award, founded to honor women's achievements in their chosen fields, recognizes a select group for their distinctive leadership, diverse contributions, and ethic of care to their local and global communities. The Courage in Community Award honors women who have made outstanding contributions in the development of decent, safe, affordable housing, and strong communities. Award winners demonstrate extraordinary leadership, the ability to adapt innovative approaches, and a capacity for building effective partnerships within their communities. The award is sponsored by the McAuley Institute, a national nonprofit housing organization with a special focus on meeting the housing needs of women and children. The award was given to Sharon Murphy in September of 1999. Through the National Caring Awards the Caring Institute seeks to identify, honor, and reinforce the activities of particularly caring Americans-those who ennoble the human race by transcending self in service to others. Each year the Caring Institute recognizes 10 adults, and 5 young adults through the National Caring Awards. Identified through a process that involves our nation's leaders in the arenas of politics, education, the arts, the media, and business, the adults and youths who are selected for recognition reflect the best of the best. These select few who are honored at a special series of events in Washington, DC have dedicated the better parts of their lives to helping others. They have created solutions where others have despaired of finding answers. The power of their example inspires a new standard of social responsibility.